Dattatreya’s 24 Gurus | It isn't time that's passing by..it's you and i.. I am reading a book on the Himalayan Sages these days called The Himalayan Masters by Pandit Rajmani Tigunait. 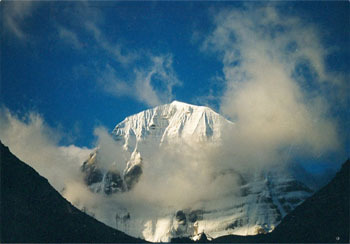 The book is a short overview on the tradition and teachings of the Himalayan Masters. In a chapter on Sage Dattatreya, the great master talks about his 24 Gurus to a king. Highly inspirational. Take a few minutes and go through it. The following paragraph is taken from the book. The ashram of Sage Dattatreya’s parents, known as Ansuya in Chitrakut, is still nestled in the beautiful Vindhya Range of the central Indian mountains. A steep mountain towers over the back of the ashram, and the serene streams of the Mandakini River issue from a nearby cave. In the air is a pervasive sense of fearlessness and tranquility. The Avadhoot (one who has shaken off all worldly desires) replied, “My bliss and contentment are the fruits of self-realization. I have gained the necessary wisdom from the whole creation, through 24 Gurus. I shall elaborate the same for you”. 1. Earth: All creatures, in accordance with their previous store of karma (action) assume different physical forms and live on earth. People plough, dig and tread the earth. They light fires on it. Still, the earth does not swerve from its course even by a hairâ€™s breadth. On the other hand, it feeds and houses all creatures. Seeing this, I learned that the wise one should never swerve from his vow of patience, love and righteousness under any circumstances and one should dedicate his life for the welfare of living beings. The earth along with its mountains and rivers is my first guru. 2. Air: I observed that air is pure and odorless in itself. And it blows on both sweet and foul-smelling things without any discrimination or preference. Though it momentarily seems to take on the smell of its surroundings, in a short while, it reveals its pristine quality. From this I learned that a spiritual aspirant should live in the world, unaffected by the dualities of life like joy and sorrow and by the objects of the senses. He should keep his heartâ€™s feeling and his speech unpolluted by vain objects. As I have learned all this by observing it, air is my second guru. 8. Sea: Contemplating the marvelous nature of the ocean, I have gained much wisdom. Any number of overflowing rivers may join it, yet the sea maintains its level. Nor does its level fall even by a hairâ€™s breadth in summer, when all the rivers dry up. So too, the joys of life do not elate the sage of wisdom, nor do its sorrows depress him. Just as the sea never crosses its threshold on the beach, the wise one never transgresses the highest standards of morality under the pull of passions. Like the sea, he is unconquerable and cannot be troubled by anything. Like the unfathomable ocean, his true nature and the depths of his wisdom cannot be easily comprehended by anyone. The ocean, which has taught me thus, is my eighth guru. 13. Pingala: The thirteenth guru that has awakened my spirit is a dancing girl named Pingala. One day, she eagerly awaited a particular client in the hope that he would pay her amply. She waited and waited till late in the night. When he did not turn up, she was at last disillusioned and reflected thus: “Alas! How stupid I am! Neglecting the divine spirit within, who is of the nature of bliss eternal, I foolishly awaited a debauchee (sensualist) who inspires my lust and greed. Henceforth, I shall expend myself on the Self, unite with Him and win eternal joy. Through such repentance, she attained blessedness. Besides, reflecting on its obvious purport, I also realized that a spiritual aspirant should likewise reject the lure of lesser spiritual powers, which are mere by-products of sadhana (spiritual practice). I learned that the temptation to secure things from otherâ€™s hands are the seeds of misery; that renunciation of these is the sole means of realizing infinite joy. 20. Maiden: Once, I observed a family visit a maidenâ€™s house, seeking her hand in marriage for their son. At that time, her mother was away from home. So the maiden herself had to entertain the guests with refreshments. She at once started pounding food-grains with a pestle. The bangles on her hand started knocking against each other, pounding sound. She was afraid that the guests might hear the sound and be unhappy for having caused her so much of trouble. As a Hindu maiden, she is not expected to remove all the bangles on her hand at any time. So she kept two on each hand and removed all the rest. Even then, they were knocking against each other and were making noise. So she kept only one bangle on each hand this time and she could finish her task in quiet. Reflecting on this, I realized that when a number of spiritual seekers live together, a lot of unwanted gossip ensues and no spiritual practice can be pursued with a single-minded effort. Only in solitude, a spiritual aspirant can carry his task. Knowing this truth, I henceforth resorted to solitude. Thus, a maiden happened to be my twentieth guru. 22. Spider: The spider is my twenty second guru. It weaves its web from the thread in the form of a fluid. After sometime, it gathers up the web into itself. The supreme projects the whole creation out of itself and after sometime, withdraws it into itself at the time of dissolution. The individual soul too, bears the senses and the mind within itself and, at its birth as a human being or any other living creature, it projects them out as the sense organs, organs of action and the whole body. In accordance with its latent tendencies, the creature thus born, gathers up all the means and objects needed for its living. At the end of its lifeâ€™s duration, the soul again withdraws the senses, mind and acquired tendencies at the hour of death. Thus have I learned from the spider. 24. Water: Water is my twenty fourth Guru. It quenches the thirst of every creature, sustains innumerable trees and all creatures. While it thus serves all living beings, it is never proud of itself. On the other hand, it humbly seeks the lowliest of places. The sage too should likewise bestow health, peace and joy to every creature that resorts to him. Yet he should ever live as the humblest of Godâ€™s creation. This simple effort on your part is on fact so complex it speaks volumes for your steadfast patience. Perseverance is the secret lock on the door to the path that leads to spiritualism. Please be clear with your object of search. Bhagavad Gita is enough to follow to reach the spiritual state you aim for. There is no one so clear in thoughts, words and deeds as Lord Krishna, who is the friend, philosopher and guide to all! Dear Ramesh, there is no such word as “enough” on the path of self realization. No one would ever tell you to stick to something “particular” to reach the ultimate goal. As soon as you do thatm you stop expanding. Bhagwat Gita is not necessary to realize yourself. There are many paths but of course they all lead to the same destination. Thanks for your genuine reaction. I can understand your mind for development. You go ahead with your kind of exploration. I think if you read my article, An Exploration of the Ultimate Reality in http://www.aparnaonline.com, it may be of some help to your in your onward spiritual journey! Wish you all the best in this New Year 2008! Good policy! Socrates also advocated that policy! That is the way to discover Self, which is most important for all! TO BE, is what i have understood. To be in present state of mind, to observe and not react. Just being is enough; understanding will come on its own. As time passes understanding & learning will be routine. We just need to observe ourselves, go were ever life takes us. Not to be opportunistic and question each situation good or bad happening in our lives. The seeker should be open to learn from anything & everything. Right from situations to beings. Knowledge should not hamper our spiritual progress. As gaining Knowledge has its side effects, it simultaneously gains ego that also unknowingly. Its a gradual process by the time we have learnt or understood something we tend to get possessed by it, displaying it at smallest of opportunity. A) try and get the same Experience over & over again. B) Or Keep talking about it all the time (Basically stuck with it). We need to leave the experience behind as the snake leaves its old skin to get new one. But we tend to get so attached to the skin that even after shedding it we keep lingering around it, appreciating as oh it looked so lovely on me or how can i get it back on me. Time is so short that by that time you understand its too late, as we are on last stage of our lives. Since spirituality is universal as well as individual, it is divided by a thin line. Balancing the same becomes really difficult. Even years or decades of penance/ sadhanas sometimes fail. As there isnâ€™t any set formula, the easiest way is TO BE. very useful post my friend. many thanks for introducing a good book through this excerpt. surely i am gonna add this one to my collection. by learning from the teachings of Lord Dattareya, humility and patience increases. Thanks to the present Datta incarnation in the form og Sri Ganapathi Sachchidananda Swamiji. Many devotees try to say that we must have a guru, but there are also many other devotees, to whom Krishna speaks through nature itself; and he leads them to his Supreme Personality. This is a prime example of the Delusion of Daksa, brought on by the desire for liberation.